Gastritis can make you quite weak and limiting for the people affected by it. Normally a person passes gas from 14 to 23 times a day, knowing that it’s healthy. If you feel the stomach is upset then you have to treat it as it embarrasses you in public. 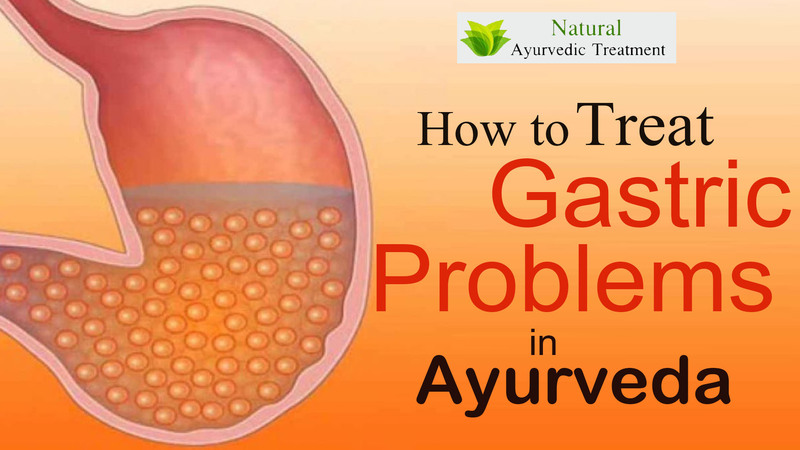 Ayurveda treats the gastric problem after fully analyzing the problem and doctors know about the various factors that are causing these complications. It studies the whole history of the patient and cures by uprooting the disease carefully. All the diseases are treated naturally and with herbal medicines that are bestowed by nature. It is able to heal from various angles and helps in cleaning the whole body. Your gas might make you bloated due to the accumulation of gas. You appear obese and your physical reputation gets diluted. Don’t panic, there are many herbal remedies for gastric problems that are recommended by Ayurvedic treatment of gastric problems. We will discuss some of them with you. Alter your diet : If you are eating a lot of spicy and prolonged foods, then you become more prone to acquiring gastric and many other problems. If you already are suffering from gastric problems, you have to avoid certain foods like coffee, tea, chillies, sour food, beans, lentils, corn, potatoes, pasta and buffalo milk among others. These very foods are avoided because these inflate the gastric problem further. Better switch to foods like pumpkin, grapes, pomegranate, melons, bitter gourd, and cucumber etc. It will be a lot better if you start writing the foods that give you gas and which are easily digested, in a diary. So you know better, which foods to be ignored and what foods are easily digested. It still will be better begin to avoid or reduce the intake of gastric foods and begin eating the others. Acidic reflux : When the reflux system goes upset, the stomach acids start touching the esophagus, thus causing inflammation and pain. If it’s unbearable try some of the following fruits and veggies. Veggies are naturally low in sugar & fat and help in lowering the quantity of stomach acid. Better go for asparagus, beans, broccoli, cooked potatoes, leafy green vegetables, cucumber, and cauliflower. The fruits that help reduce the gas are apples, bananas, melons and pears. All these help in enhancing acid reflux symptoms. You can also try eating egg whites only and try some with healthy fats like olive oil, sesame oil, flaxseeds, walnuts and sunflower oil. Put some tulsi leaves, (holy basil), saunf (fennel seeds), and spice like a clove in your mouth and chew slowly, It will help you definitely. Bloated? Try warm water with fennel seeds or ginger : Have you become bloated due to gas accumulation? If yes, you consume anything with warm water helps in reducing gas. You can also take a peeled ginger piece and boil it in water for about 10 to 15 minutes. Sip this glass after straining. If you don’t find it tasty add a spoon of raw honey in it. Fennel seeds can also be eaten with a glass of warm water. If you don’t like hot drinks chew the fennel seeds after you finish your meals, it can help in good digestion and lessens gas. If you drink tea, go for mint or fennel tea to reduce gas. If you are at home then prepare a home remedy by taking a teaspoon of fennel seeds and soak them in a cup of boiling water, add a few ginger pieces and a pinch of heeng (asafetida) and a dash of rock salt. Stir well and strain. Sip this drink after your every meal, it will help you a lot. Cooked veggies and soupy dishes will help : When your stomach gets upset, try remembering the food that you have eaten in the last 24 or 48 hours to find a definite cure. Some nourishing foods also bring in gas like whole wheat grains. Have all the cooked vegetables stir fried or steamed and add spices that enhance digestion like black pepper, cinnamon, ginger etc. When you are having meals soupy & liquid type dishes help in reducing gas. Juice is beneficial too like taking equal quantity of honey and onion juice or a glass of buttermilk and 1/4 teaspoon of garlic paste for instant relief. Let me provide you a tip, you with better remain alert while selecting the foods, especially if your stomach is getting upset quite frequently. These suggestions are provided by Ayurvedic treatment of gastric problems. Don’t drink ice water as it slows Agni (digestive fire) and digestion. Don’t eat, if not hungry. Avoid ice-cold drinks or food. Drink ginger or cumin tea once a day. Take small sips of warm water while having a meal to aid digestion and absorption of food. Add spices like turmeric, cumin, fennel seeds, coriander, and heeng (asafetida) in your diet. Avoid contradicting food combinations, like very hot and cold food or raw and cooked food together. All these are herbal remedies for gastric problems recommended by Ayurveda. 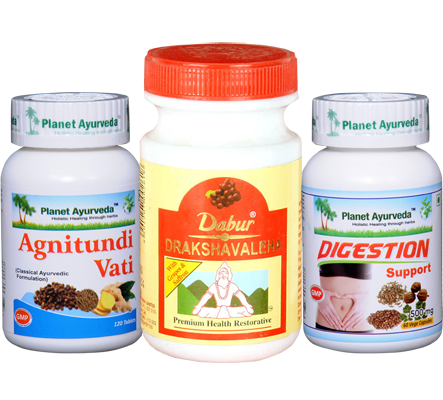 All 3 of them are called Digestion Support Pack and is available at www.planetayurveda.com. These are certain herbal remedies described to you that you can try at home. But if still not getting any desired results, better seek the advice of an expert. He/she can guide you better. If you don’t trust anybody, come to our site and our doctors can be consulted on phone numbers mentioned on the site.